Mock-up of the Singapore-based company Astroscale's "ELSA-d" space-junk removal demonstration craft. CAMBRIDGE, Mass. —“Within a few decades, we may not be able to use space anymore," Nobu Okada, founder and CEO of the Singapore-based company Astroscale, told the crowd gathered at the New Space Age Conference held on March 11 here at the Massachusetts Institute of Technology's Sloan School of Management. What the company learns from its so-called "end-of-life" ventures could eventually help Astroscale build an "active debris removal" plan for the future, Okada said. "Is there anyone who still doubts that commercial space debris removal is feasible?" Okada asked the crowd. High-speed debris from satellite explosions could cause a catastrophic chain reaction, as seen in the movie "Gravity." A few people raised their hands. If doubts are subsiding, it may be because more and more government and university research teams are investigating how to deal with space junk. At last year's European Conference on Space Debris, for example, several groups proposed their far-out methods. And later this year, a test mission called RemoveDEBRIS — which is led by the Surrey Space Centre in the United Kingdom and supported by a consortium of European industry and government organizations — will test a "chaser" satellite equipped with a harpoon and a net. But private companies eager to launch future constellations of satellites are concerned about the growing field of orbital debris and are motivated to avoid contributing to it, Okada said. That's where Astroscale comes in. For a small, yet-to-be-determined fee, Astroscale will work with satellite companies ahead of launch to affix a small, lightweight plate with a ferromagnetic coating to the craft's exterior. If the satellite fails before its nominal end of life, Astroscale will launch a retriever satellite that will track the dead craft and attach to the plate using a robotic arm with a magnetic end. Once secured, the two craft will plunge into Earth's atmosphere and burn up together. Chris Blackerby, Astroscale's chief operating officer, told Space.com that the current plan is to use one retrieval craft per piece of debris. Blackerby said that a reusable chaser spacecraft would be ideal, but it isn't yet economically viable to achieve the change in velocity required for capturing debris, bringing it to a lower orbit where it would quickly degrade and then going back to hunt for more debris. "It takes so much propulsion to change velocity, and so much time, the economics of doing that aren't there yet," he said. But future technologies, such as refueling stations in orbit or advanced electric propulsion, could change the business model, Blackerby said. In 2019, Astroscale will launch a demonstration mission called ELSA-d, which stands for End-of-Life Service by Astroscale-demonstration, the company said. It will consist of a "dummy" satellite meant to represent a piece of space junk and another satellite designed to retrieve that junk. Once in orbit at between 310 miles and 370 miles (500 to 600 km) above the Earth, the two craft will separate. The retrieval craft will attach to and release the dummy craft three times in a kind of space waltz. After the dance is done, the two will degrade together in Earth's atmosphere. 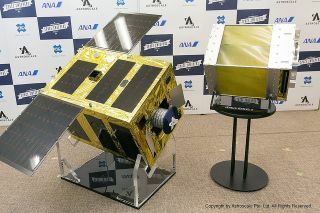 If all goes well, Astroscale hopes to begin mass producing similar satellites by 2020, Okada said. "Our mission is crystal clear — to secure spaceflight safety," he said.